It's been a while since I've done one of these. Let's give it a shot. I've already covered the movie sets elsewhere, and the Mixels should be obvious. Let's take a moment to look at some of the other new sets. 42020 Twin-Rotor Helicopter. 145 parts for $12.99. As most people can figure out, I'm a big fan of Technic parts. 10667 Juniors Construction. 160 parts for $14.99. Plenty of fiddly bits and plenty of color. 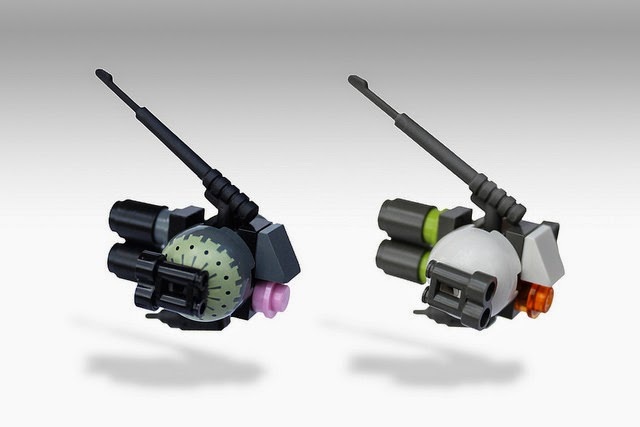 The only minuses are the mono-body vehicle piece and the minifig. 70161 Tremor Track Infiltration. 241 parts for $19.99. I've always liked the Agents line. This set is a tad monochromatic, but Tan and Dark tan can be interesting colors to work with. 70141 Vardy's Ice Vulture Glider. 217 parts for $19.99. This set is similar in color to the one above. It does have Translucent Light Blue pieces to make things interesting though. 60056 Tow Truck. 227 parts for $19.99. I feel like I get to recommend City sets so rarely lately, it's almost worth a celebration every time I do. This set has plenty of parts in Blue, White, Red, and Light Bley. 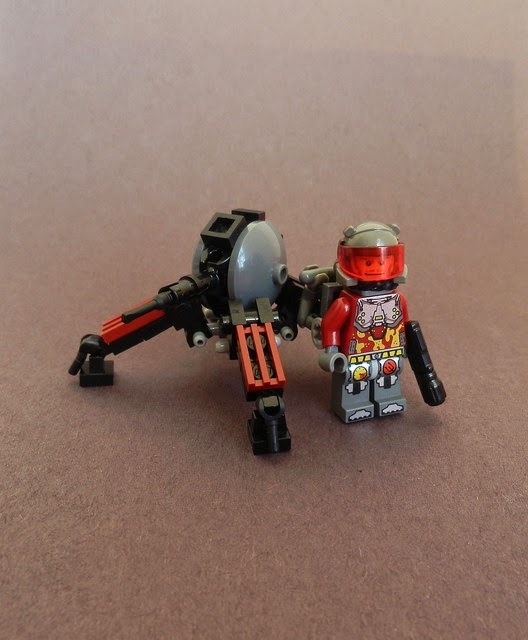 70130 Sparratus’ Spider Stalker. 292 parts for $24.99. 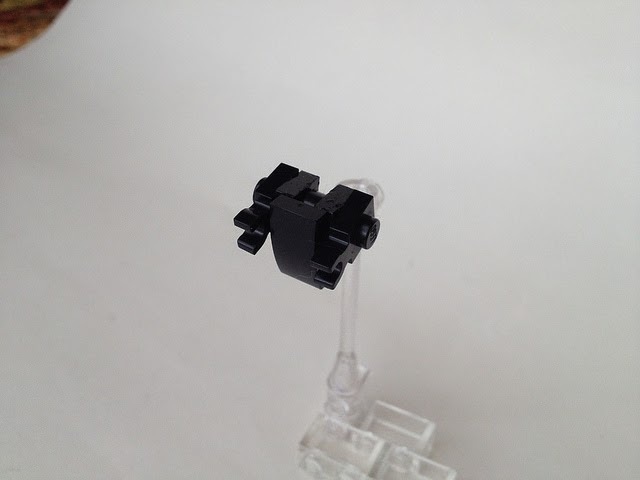 Lots of Technic bits in this one along with useful system pieces. 10673 Race Car Rally. 350 parts for $29.99. Plenty of basic bricks for terrain and a healthy amount of the fiddly stuff we love. 21020 Trevi Fountain. 731 parts for $49.99. $0.07 per piece, and while most of the set is standard bricks there are plenty of clip plates, bar plates, jumpers, skeleton arms, and SNOT bricks to make this worth it. Let's try to end out the month strong. but it looks different than most mech designs out there. 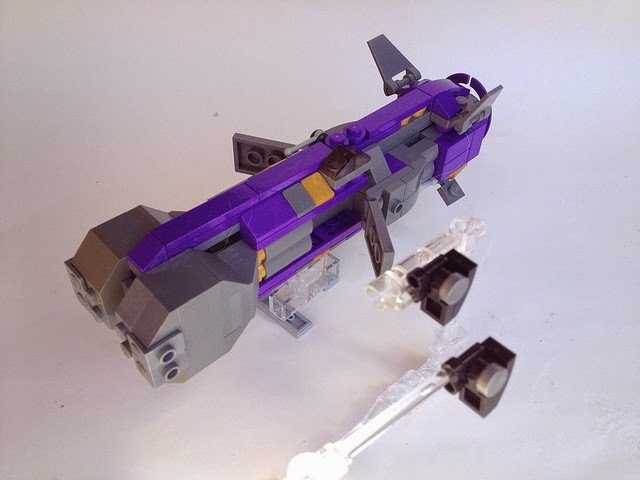 MFZ scale, but the use of color and presentation is great. look at color and size to differentiate two similar builds. and you'd have a decent Dispersed Systems Frame. storming back with this excellent little number. Of course, Dark Clouds has already done a review of this. :-) Mine might turn out a little different. Bag. Purchased at 5 Below for $3.99. Price per piece of $0.06. Parts 1. Those 2x2 Rounded Slope bricks are pretty interesting, as are the 1x2 Bricks w/Groove. I also like the 1x2 w/2 Holes. catch my eye. I'm never averse to 1x1 round plates either. 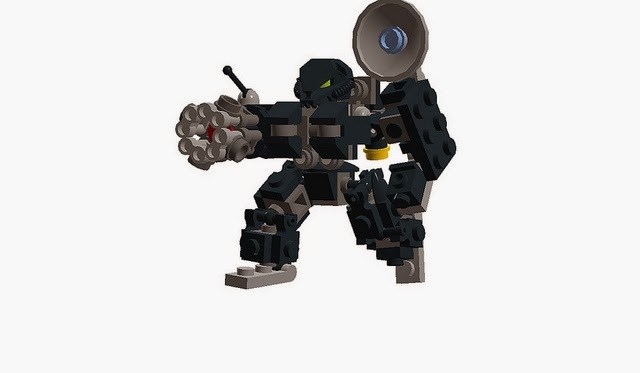 Mecha 1. Copping a bit of darksyntax's style on this one. I originally thought I wasn't going to be able to make anything using this set but switching up styles helped with that. Stats: 2Rd+d8 (side guns)/ 1B (armored legs)/ 1Y (cyclops eye) /2W. Mecha 2. This one's more of a 3P or 4P scale. I'm calling it a Robo Hover-Tank. Stats: 2Rd+d8 (side guns)/ 1B (sloped armor)/ 1G (hover system) /2W. Score: A- (+10). As I mentioned, I purchased this at 5 Below which means it should be available in most second-hand stores. Bag. Purchased for $3.99 at 5 Below which yields a price per piece of $0.11. Parts. Wow, that is a whole lotta nothin'. The half brackets are good, jumpers always come in handy, and you can never have too many clip plates. I'm not a real big fan of wheels though. Okay, I managed to pull something out of the pile of parts. It's a Frigate for IO. I'd stat it up as 2Ra+d8/1Y/1G/2W. It's a little thin but will work if you're in a bind. Score: B- (-5). Buy this one if you want the parts. Otherwise it really doesn't have much to recommend. 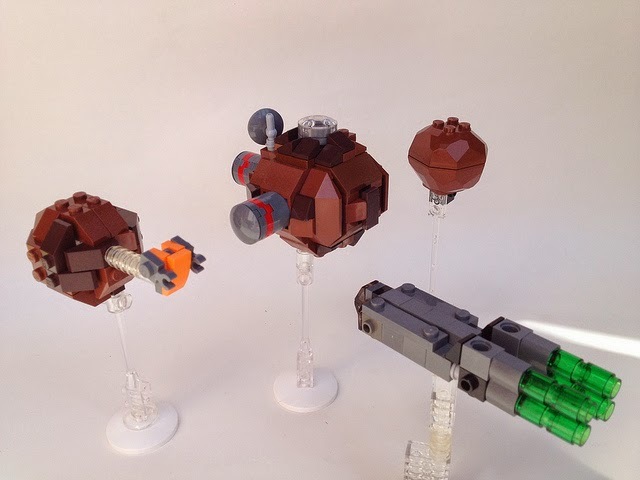 Here's a review of one of the newer polybag sets. Bag. This cost $3.99 at Toys'R'Us, which gives us a Price per Piece of $0.10. Parts. In general, I don't like wheels. I have built a few wheeled vehicles before but I don't go looking for them. Hinge parts are always good. I like the 1x2 Plate w/Bar (open ends) and the 1x2x1x2 bracket. I'm not so sure about that lift bucket though. stat it out as 3Ra/1Rd (gun) / 1B (hull) / 1G (wheels) /2W. Score: B+ (+5). I really like the Self-Propelled Gun design I came up with. It's not too far off the base design of the set and a bunch of these could make for a fun squad. The only problem is you're going to be stuck with a minifig afterwards. The Clearance sale at Toys'R'Us that I mentioned a while back will be ending on the 2nd of August. "Brown" tagged items are currently at 70% off so you can snag some serious deals before this goes away. Target is currently running its Summer Clearance sale. You can find items at 30% off and 50% off. If you want them, buy them, because they will not be there later. I know this because I made that mistake. Considering a lot of stores started with items at 50% off it may not last long. Kmart is also running a sale of 75% off Clearance items. I do not know how long it will last. Eduty has been a member of the MFZ community for a while. 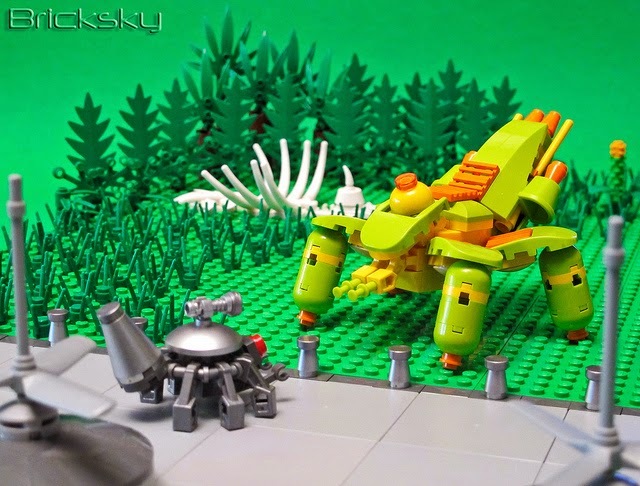 He works primarily in LDD, but has bricked up a fair amount of his designs. OMF-G1. He had a number of designs before this. This, however, is the start of the OMF numbering and the beginning of his evolution. From there he progresses rapidly. hit 22 variations by the time of this picture. OMF-G26 S1 Annie. This is the next important milestone. This is where he starts listing the PaB costs for each of his designs. OMF-G31 Trinity. If you think all he does is bipedal mecha, guess again. Check out his photostream. You will not be disappointed. 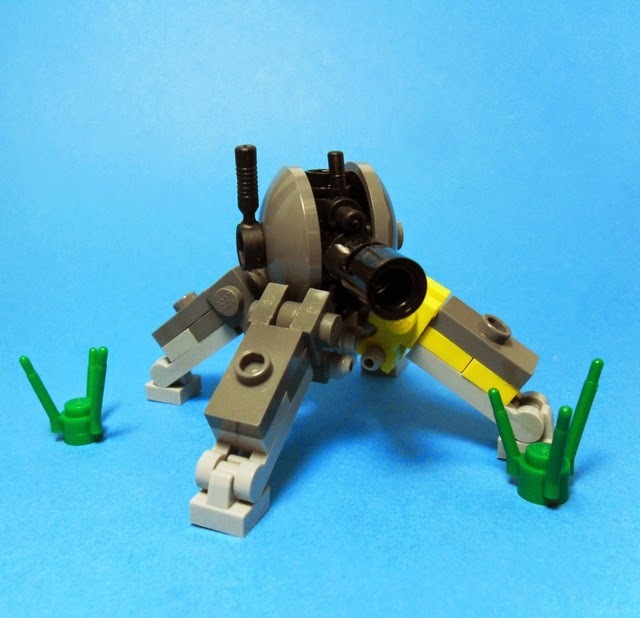 I stumbled across the instructions for Baseframe_2 in one of my random skims through Flickr streams looking for interesting mecha. 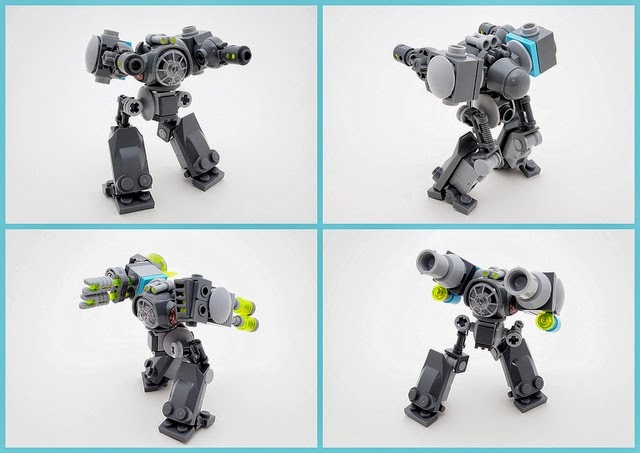 I thought the upper torso design by m_o_n_k_e_y would make for a good main torso for a mech. Now all I had to do is come up with arms and legs to finish the design. For the arms I went with a combination of techniques from Vincent Baker and Zizy. 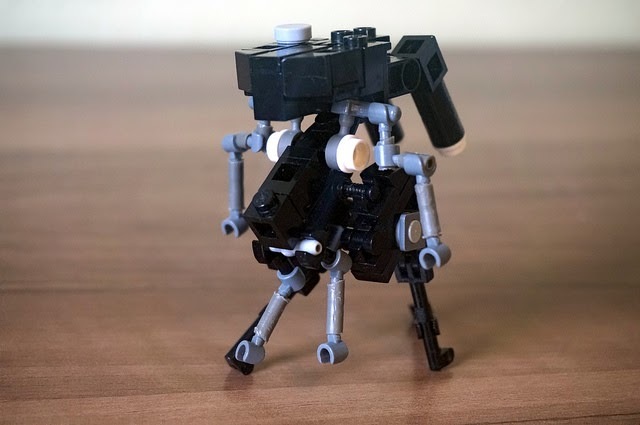 The legs are an experiment with the new Mixel ball joints. Here's what they look like all combined. I'm probably going to keep experimenting with leg designs. I'm not quite happy with this iteration. I'm also going to work on getting the color scheme a little more unified. Here's a few non-human mech designs to brighten up your day. 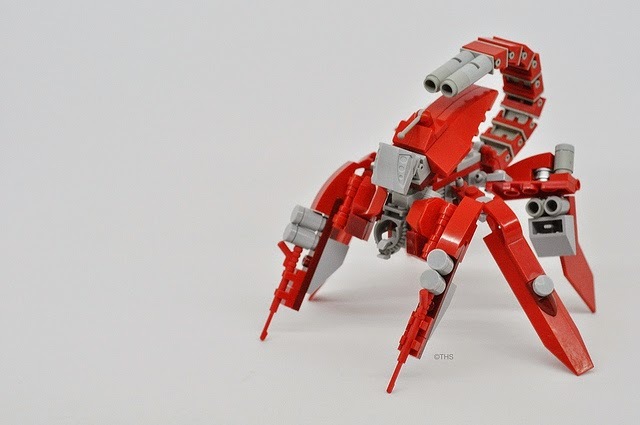 JEP.3 by Legomania. 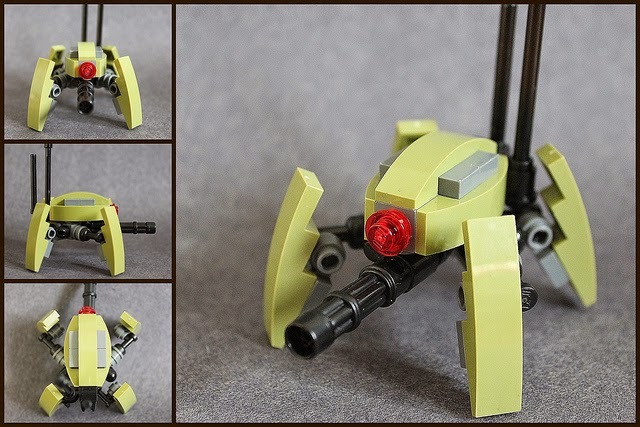 A neat little quad drone. this is the one that inspired it. Alien Cottage by lisqr. This one is just fantastic. that, this would look great stomping around a table. Daemon Inferno Mechanika by Ironweasel. Ironweasel strikes again! 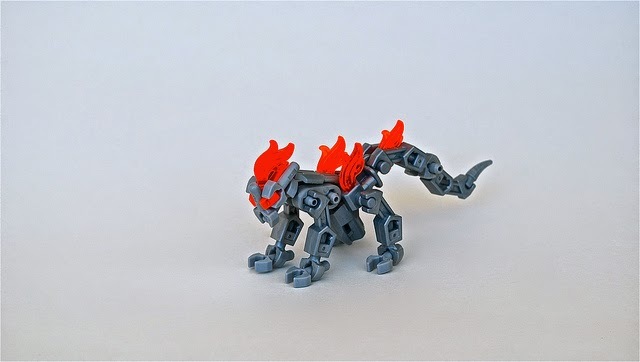 The flame pieces in the head and tail might be a bit fiddly for game play, but a pack of these would look real nice on the table. There's been a bit of discussion lately, on some of the different sites I frequent, about a handful of new mecha anime series. I figured I'd share them with you as I haven't been watching much in the way of Giant Robot/Real Robot anime recently. The first is Aldnoah.Zero. The plot is that history diverged in 1972 and we settled Mars. That settlement eventually became the Vers Empire which declared war on Earth. In 1999 a ceasefire was declared. At the start of the show the Vers Empire has started attacking Earth again. It's available on Hulu, Crunchyroll, etc. The second is Argevollen. This one features a long running war between two countries and a new super mecha. It's available on Crunchyroll. I watched most of the first episode and the mecha designs look pretty neat. The last is Knights of Sidonia. It's set in the far future where the ship Sidonia may carry the last remnants of the human race. Giant mecha, called Guardians, defend humanity from the Gauna, a gigantic, alien, shapeshifting race. It is only on Netflix. I hope you enjoy these shows. The emphasis in MFZ lately has been on Intercept Orbit. This leads me to my latest Spotlight post. 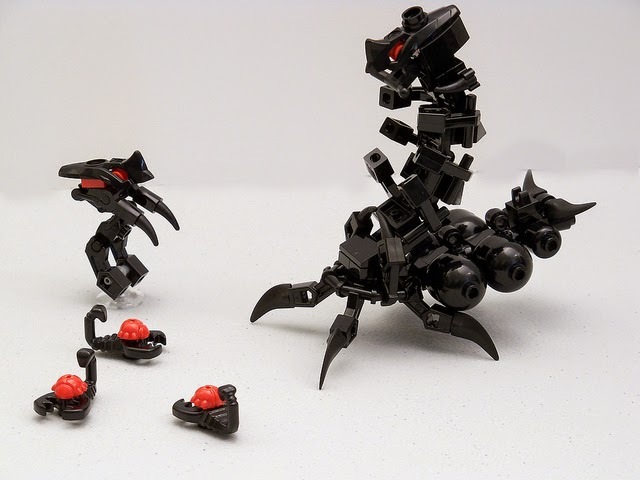 I came across these while looking through Flickr. eye. The brick-built asteroids are great. 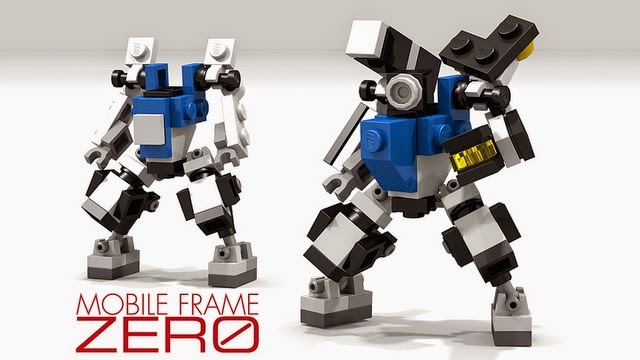 microscale frame for an IO Frame Company. might be able to cut it down to fit under the IO size limits. able to cut it down to fit under the IO size limits. And there's lots more to see in his Flickr stream. Hopefully this will inspire you in your Intercept Orbit builds. On Sunday, June 29th, 2014, four people once again gathered together to wage interstellar war. Grafvonbarnez, Tom, Stevenik, and myself returned to The Whiz to inflict great hurt on each other via little Lego spaceships. Tom (4 Tactical Assets & 7 Systems) = (6 Points per Asset) * (5 total Assets) = 30 Points. Grafvonbarnez (4 Tactical Assets & 10 Systems) = (5 Points per Asset) * (5 total Assets) = 25 Points. Stevenik (4 Tactical Assets & 10 Systems) = (5 Points per Asset) * (5 total Assets) = 25 Points. Me (4 Tactical Assets & 12 Systems) = (4 Points per Asset) * (5 total Assets) = 20 Points. Unfortunately I forgot to take pictures of our starting positions. I seize Tom's HVA. Stevenik seizes Tom's HVA from me. Grafvonbarnez seizes Tom's cruiser. Tom seizes my cruiser. I seize Grafvonbarnez's frigate. Three out of the four player's Tactical Assets take damage. No damage for Grafvonbarnez's Tactical Assets. We all tick down the Doomsday Clock. I relinquish Grafvonbarnez's frigate. I seize Grafvonbarnez's carrier. Tom seizes back his cruiser. Stevenik seizes Tom's frigate. 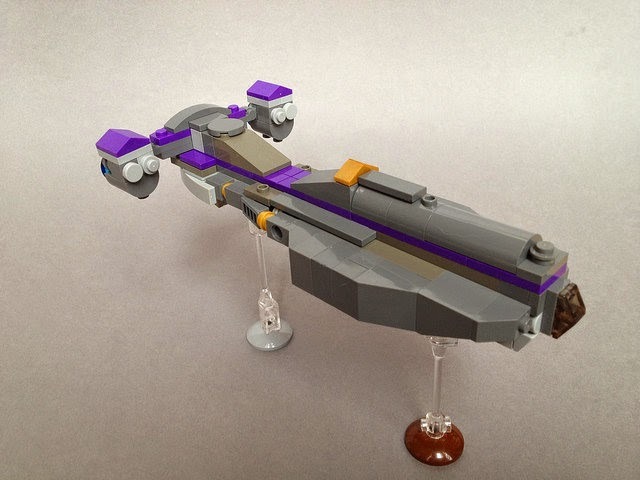 Grafvonbarnez seizes Stevenik's frigate. Tom relinquishes my cruiser. Stevenik and Grafvonbarnez tick down the Doomsday Clock. Stevenik uses Grafvonbarnez's frigate to ram Grafvonbarnez's carrier -- which is under my control. He one-shots it, rams it to death, and my frame company hops on to the frigate in response. All this to prevent my frame company from refueling and relaunching. This was the most thought out and debated move of the game. A bunch of other things happened but they just weren't as interesting. :-) Then the clock was ticked down to end the game. Stevenik continues his one-shot streak, although it is no longer in the first round. He also continues his ramming streak. Part of me considers ramming problematic, but it does elicit a giddy reaction from everyone at the table. As an experiment, we're going to play without Frame Companies our next game. At no point during the game was I in the lead. We had a larger table, but the engagement area still seemed claustrophobic. Is this an artifact of the rules? Once again we ignored the terrain placement rules. Best line of the game, "Catapults count as weapons." by Tom. June is over and it's time to announce the winners of our first contest on the Mobile Frame Hangar forums. We have a tie! Red Robot and Scrape will both receive a small Pick-A-Brick cup filled with Travis Bricks. Remember, if you want to get in on the next one, become a member over at the Hangar!